This Japanese style slicing knife from Wusthof of Solingen, Germany, incorporates some good features from both styles. Much better than a typical chef's knife for slicing vegetables and making other fine cuts, the Wusthof version is not a complete concession to Japanese ideas. Henckels of Solingen, Germany, now produces a lighter streamlined counterpart to its usual forged steel builds - the Twin Signature Asian Set features hollow ground blades of stamped high quality German stainless steel that rival the versatility of traditional Japanese santoku knives. Although this is a high quality starter set, to say that these three Wusthof knives plus a sharpening steel and kitchen shears will handle all the work of the average kitchen is not accurate. You will need more, and the storage block does have room for them. The real improvements you'll see in this 7" Santoku from J. A. Henckels have more to do with the thinner steel than the multiple hollow grind of the blade. 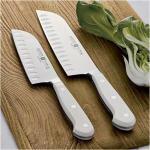 The benefits are still genuine when you compare this vegetable slicing knife to the older chef's knife patterns. 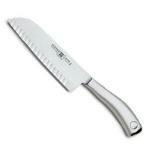 This 7" Chef's knife from Kyocera's Revolution series adds both length and depth to the zirconium oxide ceramic blade. Closer to the usual dimensions of a good santoku or chef's knife, this version offers users better knuckle clearance and enough cutting edge for larger work. I've seen a lot of knives. If on my first glance at a new knife I say Wow!--that usually isn't good. This time it's good, but if you buy the Revolution Series two-knife set from Kyocera be prepared to change the way you think.